Astronomers from NASA said Tuesday that NASA's Spitzer Space Telescope has for the first time ever captured the light from two known Jupiter-like planets orbiting stars other than our Sun. This extraordinary, spectacular achievement mark the beginning of a new age of planetary science, in which "extrasolar" planets can be directly measured and compared. 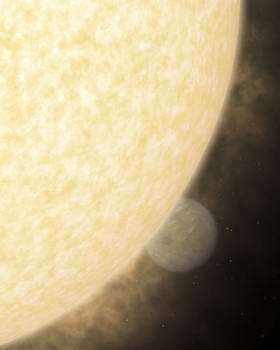 Image: This artist's concept shows what a fiery hot star and its close-knit planetary companion might look like close up in visible light. The Spitzer Space Telescope was launched into space by a Delta rocket from Cape Canaveral, Florida on 25 August 2003. During its 2.5-year mission, Spitzer will obtain images and spectra by detecting the infrared energy, or heat, radiated by objects in space between wavelengths of 3 and 180 microns (1 micron is one-millionth of a meter). Most of this infrared radiation is blocked by the Earth's atmosphere and cannot be observed from the ground. Consisting of a 0.85-meter telescope and three cryogenically-cooled science instruments, Spitzer is the largest infrared telescope ever launched into space.